This three-day DevOps Implementation training class is loaded with practical real-world tools and techniques. From the nation's largest Agile development trainers comes a comprehensive program to get you started on the road to DevOps success. You will leave this course fully literate in the whole array of available DevOps tools and lessons, ready to select what's right for you and chart a path to holistic long-term IT success in your own organization. To mature your DevOps practice, you will need to break down silos across the whole organization. 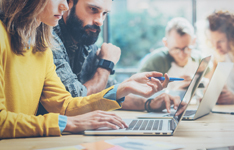 Having contributors across multiple disciplines trained in DevOps will not only help the success of your DevOps practice, but it is cost-effective too. To learn how you can get your teams trained on DevOps methodologies at a discounted rate, have a learning advisor contact you or request more information about our onsite services by using the forms on the left-hand side. Attendees who successfully complete this course receive the ICP designation after course completion. The ICP-FDO is one of two Continuous Learning Certifications (CLCs) on the DevOps Track. This certification provides an overview of core concepts for DevOps and is geared towards a broad audience of professionals, technical and non-technical. The learning objectives cover areas such as the business case for DevOps, Continuous Integration, Continuous Delivery, accompanying cultural changes, operational considerations, configuration management, etc. Participants who complete this certification will gain an excellent foundation in DevOps concepts and ingredients for a successful transition. Typically, training providers will cover the required learning objectives in approximately 14 hours of instructional activities over the course of two days. Want to plan your DevOps transformation? Get started by downloading our free DevOps Transformation Guide here. Fill out your details to find out more about DevOps Implementation Boot Camp (ICP-FDO). Overall the training was good and it is going to help me in the future. Instructor was excellent in answering questions in a relevant way. Wonderful instructor, very professional and very down to earth. Plenty of real world examples to reinforce the material that was very well handled.